Michael was born in Hong Kong in 1983. His family immigrated to San Francisco when he was three and eventually landed in Florida. After graduating from high school, Michael gained his degree in Mechanical Engineering from Georgia Tech. Despite his currently demanding work schedule, Michael is very involved in activities at his local Project Management Institute Chapter where he fulfilled his passion for teaching as the Vice President of Education. But, his desire to serve and help others doesn’t end there, he’s an avid Christian and very active in his local church. He loves kids, with two daughters of his own with his lovely wife, and volunteers at children’s church in his ministry. In an excellent new offering from author Michael Pang, In the Eyes of Madness: Declan Peters Chronicles Book One, readers will be treated to a highly original book that will keep them obsessively turning the pages from the very first words all the way through to the last. Follow the story of protagonist Declan Peters, as he struggles with the aftermath of his psychotic mother's actions. Determined as an adult to forge a relationship with his mom again, he takes a job at the institution where she lives, hopeful that he will learn more about the woman who brought him into the world. But what he finds isn't what he expected. In fact, what he finds leads him to question almost everything he has ever known, and throws him into a world of demonic possession and beings with tendencies he could never have imagined. Will Declan ever get what he came for? Will he even survive? You'll need to read the book to find out! I very much enjoyed In the Eyes of Madness: Declan Peters Chronicles Book One. This book is full of twists and turns that even I, a prolific reader, didn't expect, and that is saying quite a lot. Author Michael Pang has done a fantastic job in creating characters, especially Declan, that his readers will relate to, connect with and care about. If that isn't a hallmark of a great author, I'm not sure what is. Any reader, young adult or not, that loves a unique book of paranormal fiction, or just an interesting work of fiction in general, should read this book. I highly recommend In the Eyes of Madness: Declan Peters Chronicles Book One, and I look forward to reading the next book in this very promising series by author Michael Pang, as soon as I possibly can. In the Eyes of Madness: Declan Peters Chronicles, Book 1 is a paranormal fantasy novel for young adults by Michael Pang. Going to work at the Central Florida Behavioral Center was a natural progression for Declan Peters after he had finished high school. He had been going there on weekends to visit his mom since she was institutionalized when he was seven years old. While he had never known his father, he and his mom had had a close and loving relationship until that one fateful day when she thought he was a demon and tried to drown him in a swimming pool. Since then, he had been lovingly raised by his Uncle Ray and Auntie Jenny. He had wanted to go to college after high school, like his best friend Caleb, but his uncle's hours had been cut and Declan's income was needed to keep their family together. Caleb was home on a break from college, and while Declan was happy to be seeing Caleb again, he felt a bit resentful and envious that his friend was having the college experience that he was missing out on. 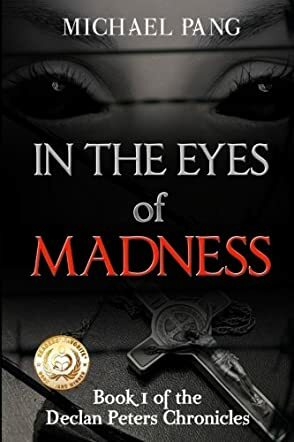 Michael Pang's young adult paranormal fantasy, In the Eyes of Madness: Declan Peters Chronicles, Book 1, is a well-written and fast-paced Christian-based story about demons and the people who fight to keep them under control. Declan is a compelling character that I couldn't help but sympathize with as he feels his life is going nowhere, and he copes with his ongoing pain over his mother's mental instability. His two friends, siblings Caleb and Keira, are marvelous foils for him, and together they bring him out of what seems like an overly regimented life -- work and living with the caring but overly strict aunt who had not yet adapted to the fact that her nephew was no longer a child. Faith, and the concept that God takes care of everything in the best possible way if you have the patience and belief, play a large part in the philosophies of both Declan's aunt and uncle and Keira, though Declan is skeptical and not quite buying it, which leads to some interesting philosophical discussions. I enjoyed reading In the Eyes of Madness. There's plenty of action, and the plot moves quite well. It's highly recommended, particularly for those with an interest in Christian-based literature. Michael Pang’s In the Eyes of Madness is the first installment in a paranormal series entitled the Declan Peters Chronicles. Declan never knew his father and his mother is in a mental institution. He lives with his aunt and uncle and works at the institution to be close to his mom. He maintains a friendship with former schoolmate, Caleb, and is secretly in love with Caleb’s younger sister, Keira. Meanwhile, Tristan and Zoe wake up to the news that their parents are dead. What follows is a string of events that leads to Declan’s discovery that he is not who he thinks he is. What follows is a glimpse of our world inhabited by demons, vampires, demon hunters and angels. And they are drastically different from what we have always been led to believe. As Declan unravels the evil that surrounds him, he also finds out that he holds a pivotal role in what seems to be a war between good and evil. But is it really what it seems to be? In Michael Pang’s novel, In the Eyes of Madness: Declan Peters Chronicles Book 1, we get to know Declan, a young man with a painful secret. As a young boy, he was nearly drowned by his psychotic mother and his life was never the same again. Declan is sensitive and compassionate and he tries to make the best out of his situation in life. His character markedly contrasts with Tristan and Zoe, the spoiled Sullivan heirs who have dark secrets of their own too. Michael Pang’s characters are well developed and uniquely interesting and, as unlikely as it seems, it is not difficult to empathize with them. In the Eyes of Madness by Michael Pang tells the story of Declan, and of Tristan and Zoe. These three young people, raised hundreds of miles away, share a very unusual connection. When Zoe and Tristan are called to Florida to identify their parents, they stumble onto Declan and realise how alike they are. Declan works at a behavioural facility, the same one his mother has been confined to since he was seven, after she accused him of being a demon and tried to drown him in the community pool. As he struggles to understand how this could happen, he begins to show more and more signs of unusual behaviour of his own. Since he worries about ending up like his mom, this concerns him a great deal. It's not long before Declan comes in contact with Zoe and Tristan, and a strange man named Victor, that more light is shed on his own past. For you see, demons are real, and so are a great many other nasties from myth and legend. I rather enjoyed the meat of this story. When I first started reading, I found it to be a little dry. After I got further into the book, it became a roller coaster of a read that swept me away. There are Christian themes to the story, above and beyond what might be found in the typical paranormal thrillers I enjoy, which are more along the lines of the supernatural. You don't get bludgeoned with it though, and the author does a good job of portraying both sides of belief. I feel for Declan, trapped as he is with people trying to push their beliefs onto him. I think that's part of what made him one of my favourite characters. I feel the author also did a good job portraying the fear and frustration of dealing with family members who have some sort of behavioural issue. That can be very scary, when a loved one’s behaviour becomes erratic, and possibly violent. It can be hard to reconcile what you remember of how a person used to be with the totally different person they've become. The story is well worth reading. If you are a fan of the supernatural, or movies like The Exorcist, be sure to check out Michael Pang’s In the Eyes of Madness! I’m definitely going to be on the lookout for the next one, and I'm looking forward to seeing Pang grow as a writer. For over ten years, Declan Peters has lived with the knowledge that his mother tried to kill him, thinking he was a devil child that needed to be destroyed in the riveting story, In the Eyes of Madness, by Michael Pang. In this first volume of the Declan Peters Chronicles, Declan learns that there is a lot more to his life story than he ever realized as he is confronted with pure evil. Through his encounter with a strange young inmate at the psychiatric facility where his mother is hospitalized and where he works, Declan begins to feel things that he never experienced before and which leave him amazed and confused. Along with his childhood friends and some people they meet through a bizarre experience at a club, Declan discovers abilities he would never have thought to be real when confronted with the need to protect those he loves. Some of the pieces of his childhood fall into place as he learns more about the young patient and the presence of supernatural forces at work in the everyday world. Will what he learns bring him any peace, or will it project him further into uncertainty and disappointment? Fast-paced action, the struggle to grow up under difficult circumstances, and the need to understand an incomprehensible truth drive this exciting paranormal story that keeps you anxiously turning the pages. Although there is a strong Christian focus, and what exorcism story doesn’t have one, the basic premise of good versus evil crosses all lines and demands the commitment of like-minded persons for the benefit of all. In the Eyes of Madness: Declan Peters Chronicles Book 1 by Michael Pang is a tremendously interesting story with wonderful depth that leaves you breathless. The concept is great, the pace is right, and the story is strong and compelling. I look forward to the next volume(s)!